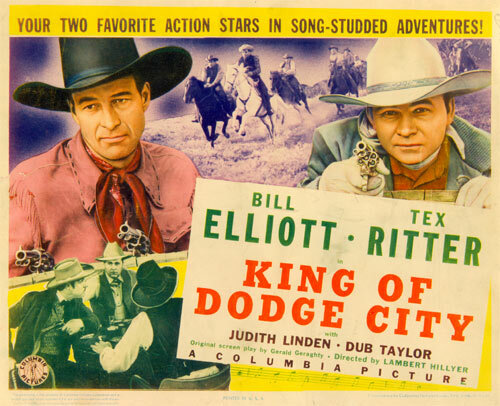 KING OF DODGE CITY (‘41 Columbia) First dynamite team-up of “peaceable man” Elliott and singing cowboy Tex Ritter is a six-gun classic. 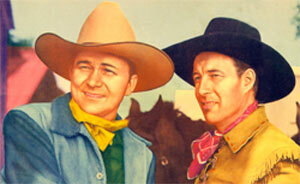 Tough, lean, witty script as the two stars ride in tandem to bring down self-styled dictator, Guy Usher—Texas style. 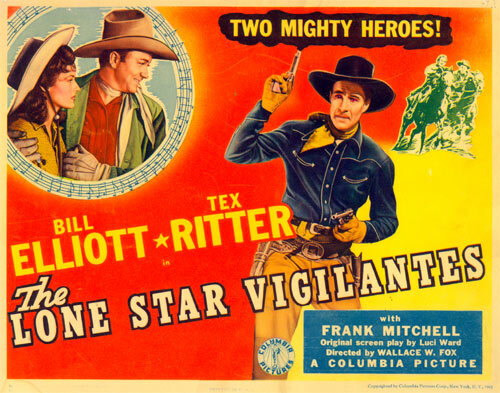 Contains one of the all time classic scenes in B-westerns as Tex taunts horse thief Jack Ingram with a song about “a low down skunk.” “Cannonball” Taylor’s last film with Elliott as Columbia moved him over to their new Russell Hayden series and brought in vaudevillian Frank Mitchell as the new Cannonball for the Elliott/Ritters. 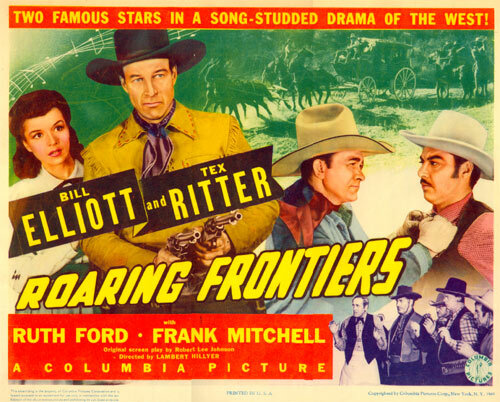 ROARING FRONTIERS (‘41 Columbia) This Elliott/Ritter co-starrer is worth it just for the wild free-for-all ending as Bill and Tex ride a stage into town and jump from it together onto the second floor of the saloon as they begin their gun-flaming showdown battle with murdering political knave Bradley Page and his thugs. Interesting by-play between Elliott and Ruth Ford—a girl who doesn’t like the west. LONE STAR VIGILANTES (‘42 Columbia) Reb soldiers Elliott, Ritter and knockabout comic Frank Mitchell return home from the Civil War to encounter carpetbagging State Police, helped by traitor Luana Walters in a good/bad girl role. This series was usually wall to wall action but this entry is hampered by a lack of it. 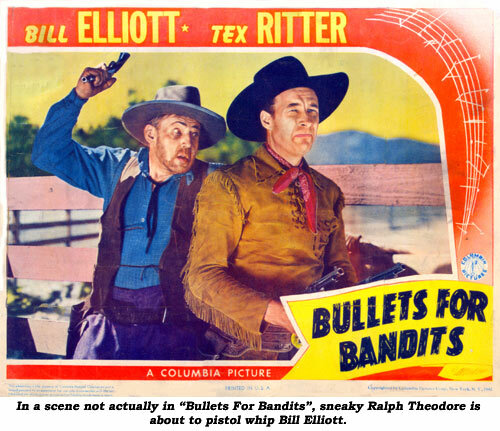 BULLETS FOR BANDITS (‘42 Columbia) Elliott and Ritter share the action when nasty Ralph Theodore tries to gain control of likeable Edythe Elliott’s ranch. The usual opposition between Bill and Tex is established before the two come together in a gun-blazing finale against Theodore’s ruthless ranihans. Tex sings three songs. 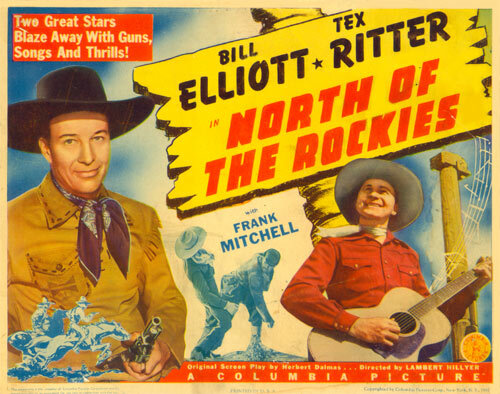 NORTH OF THE ROCKIES (‘42 Columbia) Ranch foreman Ritter and Mountie Elliott round up fur bandits. For a change, Tex gets the better role! Rousing, high energy music score adds much to the non-stop action. Look for Gertrude Hoffman, who was later so funny as Mrs. Odetts on Gale Storm’s “My Little Margie” sit-com in the ‘50s. 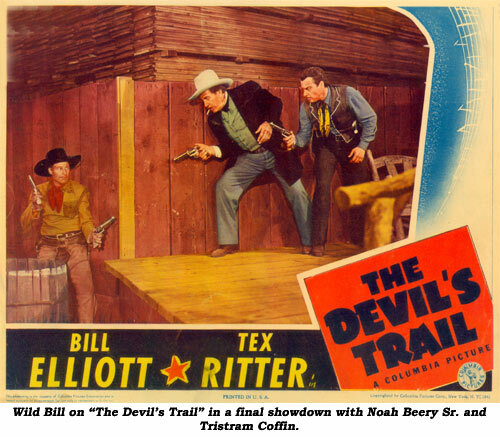 DEVIL’S TRAIL (‘42 Columbia) Strong political overtones not common to B-westerns as guns blaze and fists fly when Bill and Tex ride roughshod over Noah Beery Sr., leader of a secret society sworn to disrupt the Union and advocating slavery in Kansas. Ritter has a far better and larger role than in most of these films. He and Bill are aided and abetted by the pratfall comedy of Frank Mitchell as they come to Beery’s outlaw camp and help Dr. Joel Friedkin and his daughter of the Frontier Emigrant Aid Society who are being held prisoner by Beery. Terrific windup in what is probably the best of eight Elliott/Ritter pairings. 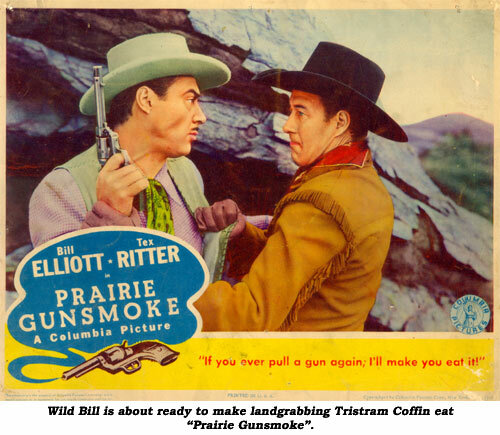 PRAIRIE GUNSMOKE (‘42 Columbia) When Elliott’s uncle is murdered for his property which contains valuable ore deposits, Bill comes gunning for his killer, landgrabber Tris Coffin and his range rats. At first at odds with Ritter (a neighbor of Elliott’s uncle) and rancher Hal Price and his daughter Virginia Carroll when they believe Elliott is one of Tris’ gunslingers, in the end they’re all united in bringing the badmen to justice. Full bore action with fight after fight making this one of the best Elliott/Ritter team ups. More screen time given over to Ritter than usual. 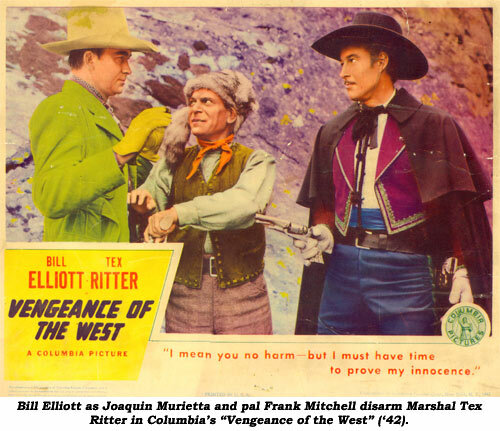 VENGEANCE OF THE WEST (‘42 Columbia) The final film in the Elliott/ Ritter series features a major change of pace with Bill as Mexican Robin Hood Joaquin Murietta—the Black Shadow—sought by Marshal Ritter and feared by the real crooks who are out to steal beautiful Adele Mara’s ranch. Little dis-concerting at first to see Bill with a black mustache. Good remake of Buck Jones’ “The Avenger”. Boo-Boo: After Tex reads Robert Fiske’s confession, he tosses it towards a table, where it flutters to the floor as he draws a gun on Elliott. Instantly, as Frank Mitchell gets the drop on Tex, the confession is mysteriously back in Tex’s hand. VALLEY OF VANISHING MEN (‘42 Columbia 15 chapter serial) Wild Bill Elliott, undercover American agent, battles a secret Raider organization who kidnapped Bill’s father to toil with others in his underground slave gold mine. The bandidos hope to defeat Benito Juarez, the legal presidente of Mexico. Although directed by Spencer Gordon Bennet, the script is episodically inconsistent. For instance—why does outlaw Kenneth MacDonald bother (early on) to wear a gold mask when Bill and others already know who he is? 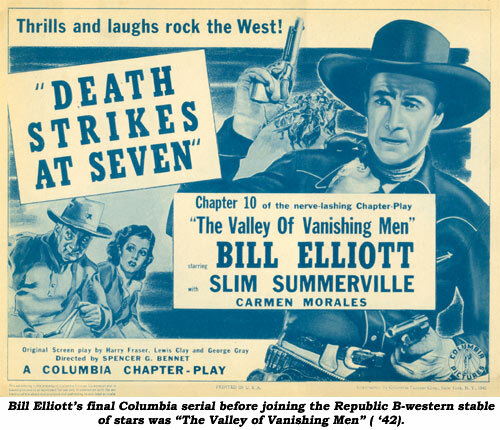 Bill’s pal is bumbling, out-of-place-in-westerns, hillbilly comic Slim Summerville. Too bad—the title and premise promise much but delivers very little.